Home » Model Horse	» BreyerWest 2017 Part 3 – The Copperfox Herd! Hi everyone! We arrived home safely from BreyerWest 2017 but I came home in less than optimal shape. We finished loading the cargo trailer at the Northwest Horse Fair and Expo around 11pm on Sunday and drove straight home. We pulled into the driveway around 5 am on Monday morning. I slept for 2 hours on Monday morning and then ended up taking a 2 hour nap in the afternoon which cut into the time that I had planned to unpack and get reorganized. Eeek! I have been feeling a bit under the weather and it seems that recovering from our weekend of plastic pony madness took me a solid 2 days. The best that I could manage on Tuesday was to get one package shipped and to start listing horses to eBay. We had the eBay Store closed while we were gone and now we have over 100 listings that expired while we were gone and those need to be relisted. I’m finally beginning to feel a bit better. My fatigue level finally been brought back to a more normal level. Thank goodness! You should be seeing BreyerWest blog posts, pictures and videos going up on the website, Instagram and YouTube. Hurray! We haven’t been as quick at shipping these past 2 days but we are back on track and should be back to shipping orders within 24 hours. We want customers to be happy and know that that quick shipping is important! Our apologies for the delay in shipping for Monday and Tuesday but now we’re back on track. I have lots that I want to share about BreyerWest 2017. We had a great time and there was so much going on that is was at times it was a bit overwhelming. We had a 10 x 10 booth that will be upgraded to a 10 x 20 booth next year. We apologize for the tight space in the booth this year. Was everyone cozy?? We did great at the BreyerWest Open Show and our show herd earned us a number of NAN cards and Championships. Hurray! 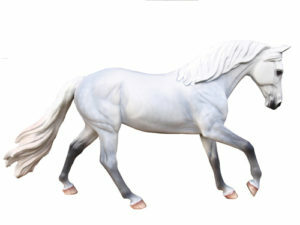 I will make a blog post featuring some of our winning Breyer custom model horses. 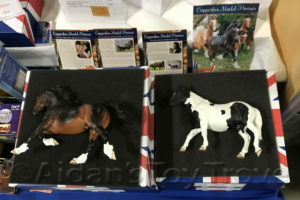 Today I want to talk about the Copperfox Model Horses that we brought to sell at the Northwest Horse Fair and Expo 2017 that was held from March 24th – 26th in Albany, Oregon. 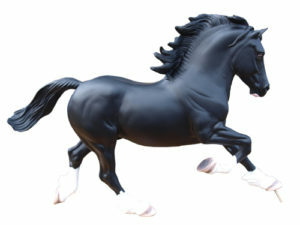 We had absolutely no idea that we would have these amazing UK based horses on hand to sell. On a whim, I emailed Becky Benfield, the mastermind behind Copperfox Model Horses. I wanted to know if there had been any progress made on having US based Copperfox Dealers and I mentioned that we would be attending The Northwest Horse Fair and Expo in 2 weeks. My memory is a bit of a blur at this point but Becky started to pull out all the stops and had Copperfox Model Horses waiting for us at our hotel when we arrived on Thursday, March 23rd. 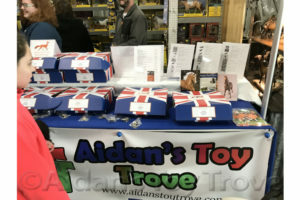 Prior to going to our hotel which was located a half hour from the Linn County Fairgrounds, we spent a long day setting up or Aidan’s Toy Trove sales booth. We arrived around 2pm and left the fairgrounds around 11pm. We pulled into the hotel a bit before midnight. We loaded the 3 BIG boxes of Copperfox Horses onto a cart along with our suitcase and computers and lugged everything up to the 4th floor where our room was located. Little did we know we had a surprise in store for us! When I inserted the key into the hotel door, the LEDs flashed red and green. I thought this odd but the door opened, so what they hay, right? We turned on the lights and started to lug everything into the room when SURPRISE, we noticed that the room wasn’t clean. The bed wasn’t made and there were empty drink bottles on the counter. Eww? We squeezed ourselves back into the tiny elevator and went back down to the front desk to request a new hotel room. Our new room was also on the 4th floor so back into the elevator we all went. I breathed a sigh of relief when the LED’s on the door lock flashed only green. We brought all of our ‘stuff’ into the room and kept the luggage cart for the night, shhh. We deserved that luggage cart right?? I lay half dazed on the bed and stared at the Copperfox tape encasing the boxes of what was sure to be beautiful horses (and ponies!) But I was tired and all I really wanted to do was sleep. In the end, the horses won out and I opened a case full of horses to take a quick peek. I was very excited to see Superman, Cadno, Lakeview Knight and Celtic Warrior for the very first time! In fact, this was the first time that I have ever seen a Copperfox Model Horse up close and personl! I didn’t open any of the other shipping cases other than to confirm that the contents looked to be in good condition. 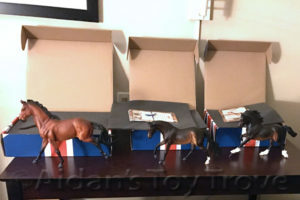 I packed the Copperfox Model Horses back into their shipping case and went to bed around 2 am. We briefly debated pulling the Copperfox Model Horses from their shipping cases to make transporting them easier. All of our show horses were still loaded into the car and were taking up quite a bit of room. We had left the cargo trailer at the fairgrounds. Cargo space was at a premium and hubby said that I couldn’t leave Aidan behind at the hotel and pile his seat full of ponies. What’s the problem with that?? But it was raining out and we didn’t want to risk water damage to the lovely Copperfox packaging and we opted to leave them in their original shipping cases. It was like playing real life Tetris getting those 3 cases of Copperfox Horses into the car on Friday morning but we did it! We arrived at the Horse Expo at vendor opening time, 8m and proceeded to finish setting up. We had A LOT of work to do but we prioritized getting the CopperFox Model Horses out and gave them prime real estate on our front table so people could look at all of them in person. We had a lot less space to work with than we would have liked but it worked! At 9 am I left the sales booth and headed over to the BreyerWest Open Show to set up my personal show horses. Hubby was manning the sales booth (manning…get it?!) while I was showing. We did some shuffling so he could get his horses on to the show table while I stood at the sales booth. The floodgates opened at 10am which was the official start time of the Northwest Horse Fair and Expo. There was a whole stampede of people rushing into the horse expo but I only caught a glimpse of it as I was still unpacking show horses. I remember glancing up and seeing a huge swarm of people over at our sales booth. I thought this would be the worst of the rush, but alas, nope! We decided to not open the sales of the Copperfox horses until 3 pm. This was around the time that I was finished with the Open Model Horse Show last year but unfortunately the show ran much later this year and it had me in quite a panic. All through the morning and early afternoon we had many visitors at the booth that were delighted to see and handle the Copperfox Model Horses in person. Many people thought that they were made of fine china or porcelain! People were amazed at the crisp detail on all of the Copperfox molds. We are glad that we decided to delay sales on the Copperfox horses so that people could see them because at 3 pm, the Copperfox horses grew wings and took flight! I was dashing back and forth from the Open Model Horse Show to our sales booth to make sure that the Copperfox sales were running smoothly. There were a few hiccups with releasing the Copperfox herd at 3 pm. A lot of potential purchasers were also still at the model horse show (like myself) and our sales booth had a line of people waiting to purchase Copperfox horses. Lakeview Knight was in high demand and we only had 2 on hand. We ended up selling him by lottery. Our apologies to those that missed out but we will try to have more stock on hand next time. We also limited sales to 1 per person per transaction. 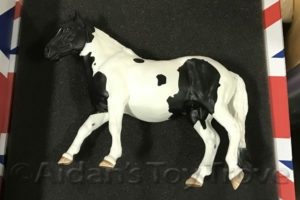 This seemed to work well and enabled everyone to purchase at least 1 Copperfox Model Horse. Some people stood in line for their Copperfox horse more than once! I was finished with the model horse show by 5 pm and hurried back on over to our booth. I was delighted that so many of the people that had purchased horses earlier in the day were still around and wanted to talk more about Copperfox Model Horses. We had a mini gathering of sorts. I was leafing through the individual Copperfox horses’ information cards right along with other hobbyists and everyone had a lot of fun learning about the various molds. There was a lot of talk about the Copperfox horse sculptors. Most notably, Morgen Kilbourn! It hadn’t clicked in my head until Morgen Kilbourn stopped by the booth that she was the sculptor of the Irish Sport Horse. That was a major DUH moment on my part! Morgen was judging at the model horse show on Friday and was a hobby demonstrator on Saturday. I know that Morgen signed at least 1 Copperfox Superman during the event. How cool is that? We specifically held back some Copperfox Model Horses for viewing and purchase on Saturday. Saturday was twice as busy as Friday. I had so much fun showing the Copperfox horses to hobbyists and nonhobbyists alike. There were a large number of model horse collectors that had never heard of Copperfox Model Horses and they were amazed with the quality. There were even non model horse collectors that stopped by the booth just to see the Copperfox horses. Their eyes lit up when they opened the boxes to look inside. The Black Pearl Friesian Dance Troupe was performing and in addition to the Friesians was a Welsh Cob stallion named North Forks Cardi. This very special horse is trained in Grand Prix Dressage and was shown on the long lines. The Welsh Cob floated around the arena in the trademark airy trot that is so frequently seen in the breed. 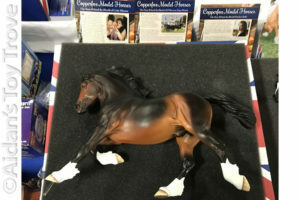 People were very excited to see the Copperfox Model Horse Tiger Woods after watching the Friesians and the Welsh Cob perform! We still have a lot to share about BreyerWest but this is a good stopping point. We just reserved vendor space at the Western States Horse Expo and will be bringing a selection Copperfox Model Horses to see and purchase! We hope to see you there! One Response to BreyerWest 2017 Part 3 – The Copperfox Herd!